Every car enthusiast has a dream garage — the four or five vehicles they would have tucked away if money were no object. I bet you already know which car you’d have for the track, the vehicle you’d choose for country drives, the one you’d keep for the daily commute, the car reserved for impressing clients and that last vehicle you’d use for carting the family around. Sadly, few of us very realize this dream but even if you make that kind of cash, who has the time to drive five vehicles around? What you need is one car that can do it all. What you need is a new BMW M5. BMW knows its customers. 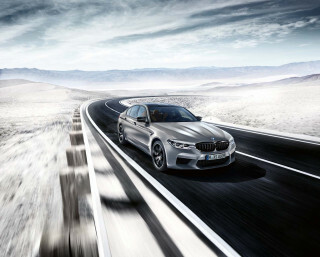 It knows that M5 buyers could easily afford a Porsche 911 or Maserati Coupe but instead enjoy the stealth factor that comes from owning a super-fast sedan. For that reason, the M5 isn’t dripping with go-faster add-ons or shod with big, glitzy wheels. There’s a subtle new front fascia, which helps cool the engine and channel air to the brakes, broader front fenders with signature “M” air vents, new rocker panels, and a new rear bumper which houses four modest tailpipes as well as helping control the car’s rear airflow. The rear bumper diffuser works with the new trunklid and tiny rear spoiler to keep the M5 stable at Autobahn speeds without upsetting the styling of the car. 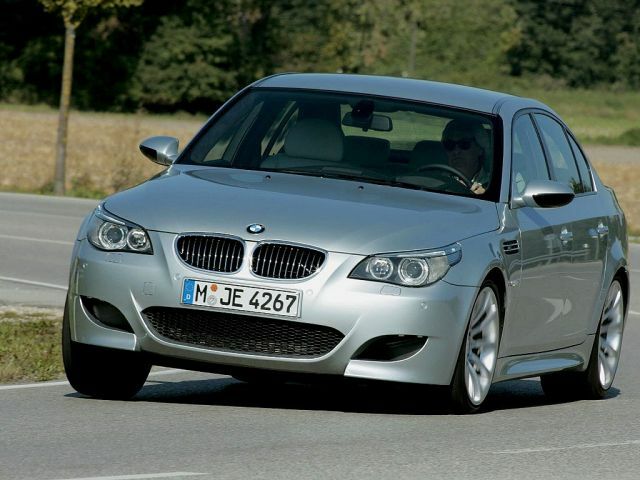 The understated package is then rounded off with some tasteful 19-inch wheels and a few small M5 badges here and there. If you’re into automobiles, then there’s no mistaking the new M5, but those who don’t already have a dream garage will think it’s just another 5-Series. The interior is just as subtle as the exterior. I think I counted three tiny M badges in there, excluding those on the floor mats and kick-plates, but beyond that it simply looks and feels like a top-of-the-line BMW. Passengers will enjoy the tasteful décor, the sports seats with optional (and annoying) active bolsters, and the fine entertainment system. The driver still has to contend with the awful iDrive system and wonder why he has to negotiate several menus just to change radio stations when whole swathes of dashboard real estate go undeveloped, though the voice recognition system does help carve through the nonsense once you learn its language. The overworked steering wheel area is another ergonomic nightmare, with two gearshift paddles, three stalks, and a bunch of steering buttons to contend with. It works fine when you’re awake and alert, but when it’s late and you’re tired you’ll find yourself turning on the turn signal instead of canceling the cruise control or putting on the high beams instead of changing gear. BMW really needs to rethink this whole iDrive thing because it ruins an otherwise quiet, comfortable, attractive, and well-made cabin. Of course, it’s the M5’s hardware that really matters, and in this respect BMW has surpassed all our expectations. The BMW M5 is powered by an amazing 5.0-liter V-10 engine that channels its power to the rear wheels via a seven-speed, sequential-manual gearbox. BMW reckons that 0.5-liters is the ideal size for a cylinder, which is why they went to ten cylinders instead of the old M5’s eight, though you can be sure the fact they build V-10 engines for the Williams Formula 1 team also has something to do with it. The 40-valve, quad-cam engine uses other race-derived technology like individual throttle bodies for each cylinder and dry-sump lubrication to achieve its stratospheric 8250-rpm redline and astonishing 500 hp output, but for those dreary commutes in stop-go traffic you can take it out of “M-Drive” mode and amble around with “just” 400 hp. The M5’s peak torque of 383 lb-ft isn’t as headline-grabbing as the power output, but there are seven paddle-selected gears to choose from to overcome the engine’s peaky nature. Unlike previous Sequential Manual Gearbox (SMG) units, this gearbox wasn’t derived from an existing manual transmission, so the engineers had the freedom to arrange the cogs in whichever order best suited quick-shifting. As a result, the M5’s gear-changes are smoother, faster, and more enjoyable to use than any SMG gearbox before it. It’s not quite as slick as VW’s DSG unit yet, but it’s very, very close. Then there’s the chassis, which can also be reconfigured depending on how you’re using the car. In street-mode the suspension is firm and sporty though it remains poised and refined over even the worse surfaces, while the steering is well weighted and more responsive than you’d find in a regular 5-Series. It feels wonderful, to be honest; like a really well-engineered sports saloon that you could really have some fun in. Hit the steering-mounted “M-Drive” button, though, and in addition to an extra hundred horsepower, the throttle sharpens up, the steering power-assistance is wound back, the gearshifts are executed with lightning rapidity and the suspension firms up considerably. The overall effect is astonishing. It goes from merely fast to oh-sweet-mother-fast; turns in with Ferrari-like tenacity; grips like a love-starved leech and remains beautifully balanced no matter what you throw it at. I’ve driven all kinds of exotica over the years and this is a match for any of them, which wouldn’t be so mind-boggling if I wasn’t enjoying this incredible driving experience at the wheel of a two-ton sedan. If your head has a tough time imagining what a four-door sedan with leather and sat-nav and power heated seats feels like searing to 60 mph in 4.5 seconds and topping out well beyond the official 155 mph, then the brakes will probably boggle what’s left of your mind. The 14.7-inch front and 14.6-inch rear rotors are cross-drilled and are made of fade-free, track-ready, compound materials and clamped by massive dual-piston calipers. Standing hard on them is simply an eye-popping event, figuratively and literally, and is simply another example of the uncompromising nature of the M5’s engineering. We drove our M5 more than 2000 miles from New Jersey to Houston and couldn’t imagine a better car for the trip. When we needed to relax and make time, the M5 chewed up miles with astounding ease, but when we wanted to tear up the “Tail of the Dragon” in Tennessee the M5 was more than a match for this extraordinarily demanding road. It’s a sensible sedan with the heart and soul of a racecar. Forget your five-car dream garages. All you need is an M5, which, at $81,200 is actually something of a bargain.